Four years ago, California's Three Feet for Safety Act took effect. In theory, at least, the act requires a driver passing a bicyclist to stay at least three feet away. The law flew through the statehouse with strong support from bicyclists, cycling advocates, and politicians including former L.A. Mayor Antonio Villaraigosa and now-State Sen. Steven Bradford. Bradford, at the time a member of the state assembly, deemed it "a powerful tool." But in Southern California, the police haven't found much use for it. Since it passed, LAPD officers have written just 13 citations for violating the three feet law. In Long Beach, police issued four citations during the law's first 1,475 days. Supporters of the law said those tiny numbers are disappointing. But they are not surprised. Ultimately, they say it amounts to asking drivers politely to change their behavior. "This law would not matter if people would just slow down and drive safely," said Ted Rogers, who writes the website BikinginLA. "But because so many people don't, we have to have this law. And it has to be enforced." Southern California has the building blocks of a bike utopia — year-round great weather, a flat grid of wide roads, and a health- and environmentally-conscious population. The reality? Bicycling Magazine deemed Los Angeles America's worst city for bikes. 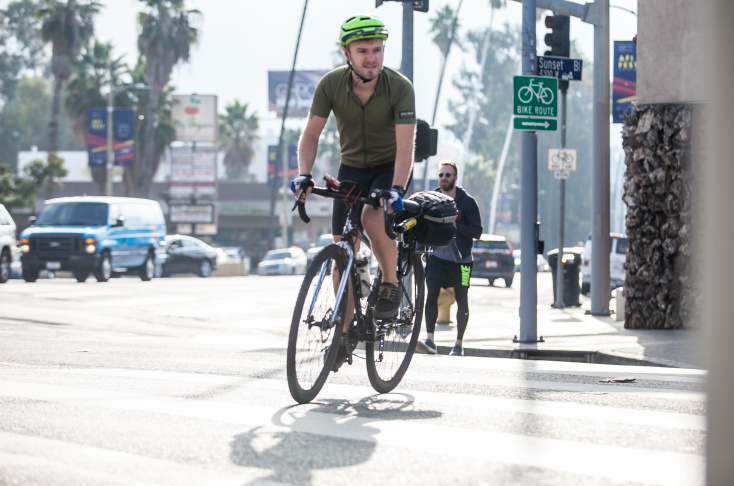 Bike commuter Topher Hendricks will take every inch a driver gives him. His 10-mile trip takes him from Downtown L.A. to Hollywood. It's a journey that sounds more like an obstacle course than a commute: he maneuvers around potholes, sewer grates, car doors opening into bike lanes, trash cans in the streets, dogs and more. Hendricks has learned to be quick on his brakes, but even that doesn't prevent collisions. "I'm a stickler for following all the laws and staying in the bike lanes," he said. Still, Hendricks has been hit repeatedly. Two weeks before he talked to us in October, he was struck by a car turning right at the intersection of Sunset Blvd., Fountain Ave. and Hoover Street. "Even though there is the three feet law, I'm never going to feel safe sharing the road with cars. There's just, there's no way," Hendricks said. The streets are so dangerous that he hesitates to be open with loved ones about his experiences. "I definitely also don't explain the extent of it to everyone," he said. "Especially my girlfriend, who would probably be a little too worried." The tricky intersection where he was hit is part of what's known as L.A.'s 'High Injury Network.' The name reflects the frequency of pedestrian and bicycle collisions along those corridors, which include stretches of Sunset Blvd. and Fountain Ave.
Across Los Angeles, it's difficult to analyze whether bicycling is getting more dangerous or less dangerous. 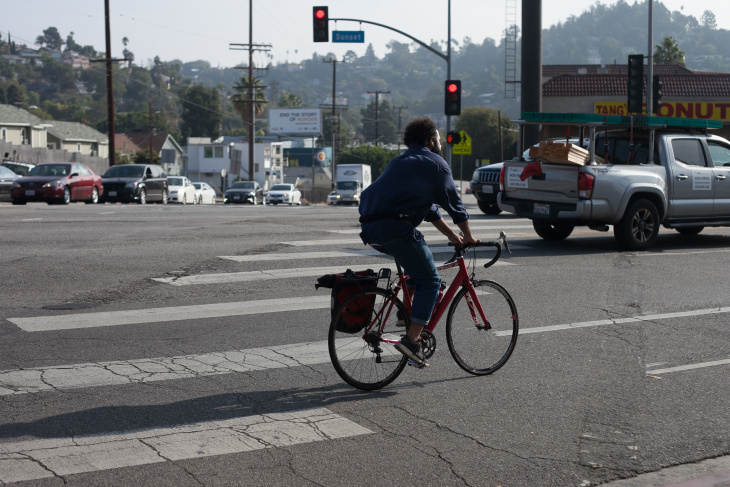 In 2013, the year the three foot law passed, L.A. had 17 bicyclist fatalities. Last year there were 14. Keep in mind, there are thousands of non-fatal collisions each year, including many that go unreported. Expansion of the city's bike network has slowed dramatically in recent years. And distracted driving poses a serious and growing threat to cyclists. "The city is doing virtually nothing to address safety, other than talk about it. Talk doesn't do a damn bit of a good," said BikinginLA's Rogers. "It's gotten worse over the years," Hendricks said. The confluence of factors has cyclists and safe streets advocates looking beyond California's rules of the road. It didn't start out that way. Hopes were high for the Three Feet For Safety Act when Gov. Jerry Brown first signed the law. With Brown's signature, the state joined at least 20 others with similar laws. California's law calls for violators to be fined $35, which can be bumped up to $220 when a collision happens. The bill had support not only of bike groups, but also the Automobile Club of Southern California. Former L.A. Mayor Antonio Villaraigosa described the law as a no-brainer in a recent interview. "People on bicycles are not as protected, if you will, as you know people in a car. And giving them a three foot space between you and them is not a lot to ask," he said. When he decided to back the law, Villaraigosa was pushing for bike infrastructure across the city. For him, it was personal. In 2010, Villaraigosa shattered his elbow while cycling along Venice Boulevard. He'd been hit by a taxi cab that drove into his path in a bike lane. That was Villaraigosa's third bike collision. He's stayed off bikes ever since. Villaraigosa was perhaps the most prominent backer of the three feet law. Similar bills had been vetoed by Brown twice. Advocates believe a tweak made it more amenable the third time around. That change allowed motorists to leave less than three feet between their vehicle and a bicyclist, if they slow to a "reasonable and prudent" speed and pass safely. The compromise may have eased passage but it disappointed advocates. "It took the teeth out of the law," said Colin Bogart of the L.A. County Bicycle Coalition. Bogart believes the law still is a meaningful educational tool. The three feet requirement is included in the the DMV's driver handbook, for example. And it could come into play in lawsuits over collisions where the three feet rule was violated. The LAPD's 13 citations come to one citation every 112 days, at an agency with 10,000 sworn officers that patrols a city of 4 million. The LAPD said delays in data entry mean it's possible recent months may have recorded additional citations; the agency did not respond to several interview requests. The baker's dozen of citations make up a tiny fraction of the more than one million traffic citations the LAPD has issued since 2014. In Long Beach, the four citations amount to less than one per year by police, who patrol a city of 470,000 residents. Lt. Kris Klein of the LBPD said that the law can be difficult to enforce. "The officer has to see the violation happen in front of them," he said. But he thinks the law has made drivers more aware of cyclists, and that new infrastructure is keeping everyone safer. "The City of Long Beach as a whole has made huge strides in increasing bicycle safety," Klein said. Experts said that even if the law were rigorously enforced, it would only go so far. "I actually don't think giving traffic tickets incentivizes people to drive differently," said Boston University economist Jay Zagorski. A huge increase in ticketing would make a small dent in public awareness in a region as vast as Southern California. One way to change that? Dramatically boost the dollar amount of penalties. "But society really doesn't want to make these fines exceptionally high," Zagorski said. Current penalties for breaking the three feet law are less than many parking tickets. Even then, there's evidence that enforcement is no cure-all. Tom Vanderbilt, author of a book about traffic, said: consider drunk driving. After decades of public awareness campaigns and police crackdowns, the percentage of fatal crashes attributed to impaired drivers has been cut dramatically. Even so, drunk drivers still kill thousands of Americans each year. Enforcement alone won't solve the problem. That has safety advocates taking a harder look at the actual infrastructure we use to get around. One way to dramatically increase safety for cyclists would be to redesign streets. "You should build a system in which the driver, it's physically impossible for them to be within three feet of a bike," Vanderbilt said. The emphasis on infrastructure has been pronounced among advocates across the country. Colin Bogart of the Bicycle Coalition pointed to projects like a new protected bike lane on Spring Street as the way forward. "That's really what we should be emphasizing. Because that works 24-seven." Topher Hendricks, the bike commuter said: "All it takes is one car not paying full attention to slam into me...There's not much I can do on a bike to prevent that." As for the three feet law? "It's a nice gesture, I guess. But it's, it's pretty," he trails off. "It rings pretty hollow." Investigative journalism matters. Here at LAist, we believe Angelenos deserve hard-hitting reporting that holds officials accountable and shines a needed light on our government and public institutions. Now that we're part of KPCC, those stories are made possible by generous people like you. Independent, local journalism isn't cheap, but with your support we can keep delivering it. Donate now.